The new building was begun in August, 1886, and the foundation stone laid on All Saints' Day by Sir Henry Bromley of Stoke. It is designed in the style known as Early English, or that, which was in vogue in this country in the thirteenth century. The new church though considerably larger than the building, which formerly occupied the site, follows in part the lines of the church it has replaced. The nave and chancel occupy precisely the same position as those of the old, but the west tower of the old church has been replaced by a baptistery, and the new tower, north aisle, organ chamber, vestry, and east end of the chancel, occupy new ground. The new building is almost entirely of red brick, Ancaster stone is used for the window copings, and moulded stringcourses externally, while internally red Mansfield stone is used prominently. The tower, surmounted by a brick spire, rising to a height of about 105 feet from the ground, occupies a position at the northwest corner of the building, the lower part of the tower forming the porch and entrance to the church. From the porch, a winding staircase leads up into the belfry, where two new bells, the gift of Mr. and Mrs. J. G. Branston, have been added to the three old ones, the old ones having been recast by Messrs John Warner of Cripplegate. 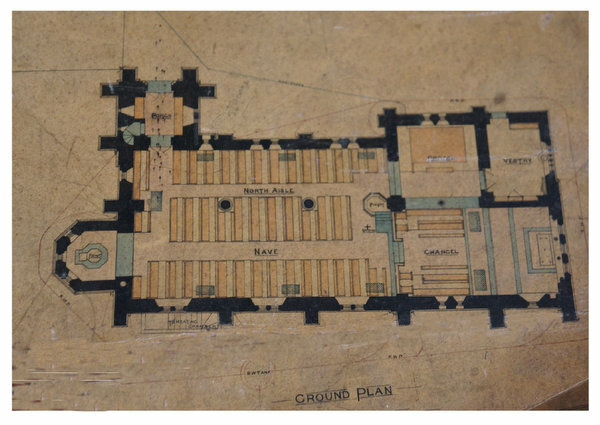 The plan of the church includes a nave about 47 feet in length by 18 feet wide - north aisle, 47 feet by 11 feet - chancel, 28 feet in length by 17 feet wide - organ chamber, 15 feet square - vestry, 10 feet by 14 feet and a small baptistery at the west end. An arcade of three arches of moulded bricks, supported by shafts of alternate courses of Ancaster and red Mansfield stone, divides the nave from the aisle. The passages are tiled, and the spaces under the seats are paved with wood blocks. The seats are of pitch pine wood, and are arranged to accommodate a congregation of 166 persons. The roofs, also of pitch pine, are of open timber construction. Three two-light windows light the nave. Two of these are filled with stained glass. 2. Our Lord standing in Jordan, the Holy Spirit descending on Him. 3. Our Lord blessing little children. The font is of Ancaster and red Mansfield stone - a beautiful example of the mason's art - and, like the furniture and fittings through­out the church, has been executed from special designs. The font cover is in the form of a spirelet. It is of light wrought iron work, and has been executed by the same firm who were entrusted with the wrought iron chancel screen - Messrs Shrivell, of Longacre. The upper part of the pulpit and the carving throughout the church, including the altarpiece and the altar, was carried out by Messrs Earp of Lambeth. The altarpiece of Ancaster stone is divided into three richly moulded arches supported by detached shafts of red Mansfield stone and four small niches. The central panel represents the Crucifixion, and those to the right and left scenes from the Old Testament -Moses striking the rock, and the Children of Israel being fed by manna. The four niches contain figures of the four Evangelists. The altar is of walnut wood and red Devonshire marble the whole being richly decorated. It is divided into three panels. In the centre is the Agnus Dei, and on either side groups of figures forming a choir of angels. These paintings are from the studios of Messrs Heaton, Butler, and Bayne and one is struck not only by the beauty of the design itself, but also by the extremely refined manner in which the work has been executed. The stained glass throughout the church is from the same firm. The three lancet lights, which form the east window, have deeply recessed and moulded internal arches, supported on detached shafts of red Mansfield stone. A further recess carried up from the floor level encloses the altar, the altarpiece, and terminates in one arch over the east lights. The paneled roof of the chancel follows the sweep of this arch. No brickwork is seen in the chancel; everything has been arranged here with a view to future decoration in colour. 1. The window over the sedilia, The Virgin and Child. 2. In the choir, Our Lord appearing to Mary Magdalene. 3. Also in the choir, Our Lord washing the Disciple's feet. The chancel floors are tiled with glazed and encaustic tiles. Many of them are from special designs and contain monograms, crowns, and palm branches, symbolising All Saints. The tiles were manufactured by Messrs Carter Johnson of Worcester. The chalice and flagon, the beautiful altar cross and ornaments, are the work of Messrs Barkentin and Krall, of London. The wrought iron lectern, pulpit, desk and the gas standards and brackets, were made by the same firm from special designs. The choir stalls accommodate a choir of twelve boys and ten men, and there are also two prayer desks for clergy. The organ is from Messrs Fincham's works, Liston Road, London. In the west window of the north aisle there is to be placed a stained glass window given by Miss Ward of Winthorpe. On a brass near the baptistery are the words "To the Glory of God, and in memory of Philip Handley of Muskham Grange, this church was rebuilt, and consecrated June 7 1988." The date given is that originally fixed for the consecration, but it had to be postponed through the illness of the Bishop. The baptistery itself is dedicated " To the memory of Robert Bruce Russell, the children's friend," who was an old college friend of the Rector. Of the beautiful stained windows on the south side of the nave, one representing Martha and Mary, and The Last Supper, bears the inscription, "To the Glory of God, and in loving memory of Joseph William and Elizabeth Gilstrap Branston, this window was erected by their children, 1888." Another memorial window is given by Mrs. Gilstrap "To the Glory of God and in loving memory of George Gilstrap of Winthorpe. Born February 1822. Died December 1864." The subjects are The Raising of Lazarus, and The Woman of Sumaria. On the south side of the chancel the subject of one window is Christ washing the disciples' feet. The window is to the memory of Georgiana Handley of St. Georges Home, Capetown who died December 14th 1874. Another window adjoining, representing our Lord appearing after his resurrection, is inscribed to the memory of Sister Laura, Community of All Saints, who died at Capetown June 16th 1882. Another window depicting St Mary the Virgin and the Infant Saviour, is in filia memory of Caroline Handley who died January 19th 1860. The beautiful altarpiece is offered in filial memory of Henry Handley of Culverthorpe, Lincoln, who died June 29th 1846. The east window is the gift of Mrs. Edward Gordon, daughter of a late rector of the parish, and represents our Lord reigning in glory surrounded by His Saints. In the chapel where the organ is placed are collected many of the tablets, which were in the previous Church. The vestry is built on the site of the old one, which covers the Handley vault, and the walls are surrounded with tablets commemorating those who are buried in it. Amongst them may be mentioned Mr. William Farnworth Handley of Newark whose immediate ancestors are interred at Newark Church. He was a deputy-lieutenant and magistrate for the county, served the office of Sheriff in 1822, represented the borough of Newark in several Parliaments, and died there 4th December 1851 aged 71 years. His brother Mr. John Handley who died in 1856 and Mr. Benjamin Handley who died in 1858 are also commemorated. The latter served in the 9th Dragoons in South America and in the Peninsula. He was returned member for Boston in the first session after the Reform Bill. The late Mr. John Handley and Mr. Philip Handley are also buried in the vestry. Amongst the tablets in the organ chapel is preserved one to the memory of Robert Taylor physician in ordinary to His Majesty; who died in 1702, and who remarkable career is narrated at some length in the histories of Newark. Plan View of All Saints' Church, Winthorpe. All Saints' Church in Volume1. The Bells of All Saints' Church in Volume3. Winthorpe Church - Property - 1764 in Volume 4. The Churches at Winthorpe in Volume 4. Winthorpe Church Windows in Volume 4. Stained Glass Windows in All Saints' Church in Volume 4. Memorials In All Saints' Church in Volume 4. All Saints' Church Bells, Winthorpe in Volume 4.